Knowing the area has such a diverse range of land types from the rural properties in Oratia, Waitakere, Laingholm, Henderson Valley, Parau and Huia to the grassy suburban sections in Te Atatu, Titirangi, Massey and Glendene, to the couple & family friendly properties in Kelston, Blockhouse Bay, Henderson and New Lynn, means having a good range of options and equipment is essential. Robert & Christine believe in quality products at an affordable price that do the job they claim to do. Looking after the West Auckland community with no nonsense advice and recommendations backed by Expert and Husqvarna is a very satisfying experience, and the huge growth in repeat visits shows that West Auckland is happy to support the local experts in return. 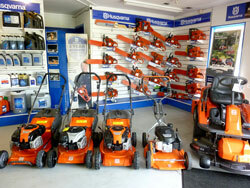 Expert Mower & Chainsaw Services is the local authorised dealer for the Husqvarna brand. 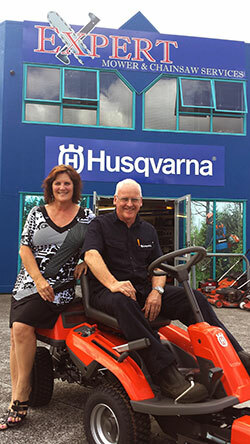 After a history with other quality brands in the market, Robert and Christine are convinced that Husqvarna provides the best range, plenty of options in each category and product value for money. Subsequently, the shop proudly devotes most of its space to Husqvarna products. Our retail shop offers a range of quality lawn mowers, blowers, hedge trimmers, line trimmers, brushcutters and chainsaws - all at very affordable prices and with good warranty periods. Products are assembled, run up, explained and ready to go at the time of purchase. We offer a free* first service after a period of using the equipment. Small jobs like sharpening chainsaw chains, sharpening mower blades & fixing broken pull cords can often be done while you wait. Or if you have a machine that needs servicing or repairs, our experienced workshop team deals with all major brands. We can service ride-ons, and subject to the size of the machine, can also offer a pick- up and delivery service in West Auckland for a $50 charge. “Most importantly, we offer the opportunity to discuss your requirements with us and let us help with relevant advice on what to look for in a product. Every dollar you spend is important, and we want you to have the best result when you purchase any product.